This posts continues looking through the book The Limits to Growth, summarizing it and offering my thoughts on what it has to say. 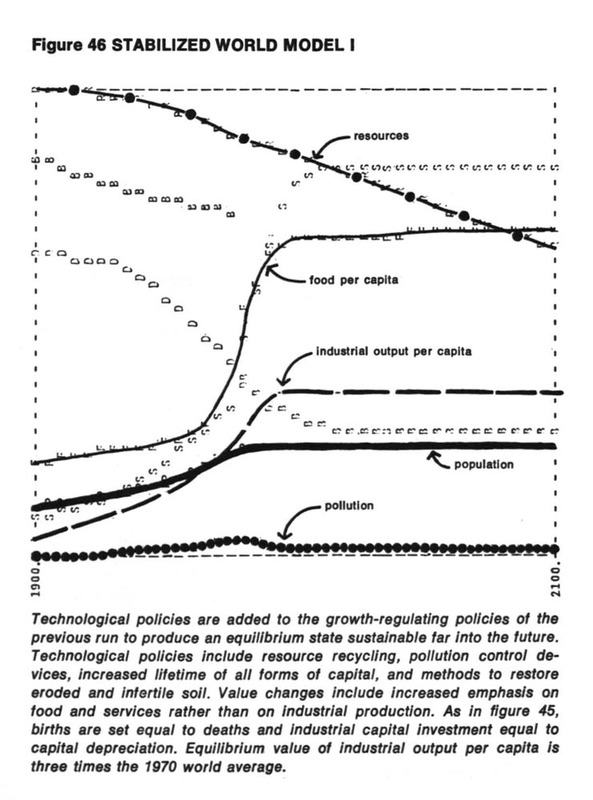 In my last post (insert link) we finished with Chapter IV, Technology And The Limits To Growth. In real world finite systems there are negative feedback loops which stop positive feedback loops from generating exponential growth and collapse. The delays in the negative feedback loops allow overshoot to occur, which is wasteful of resources and actually reduces the carrying capacity of the environment, leading to a deeper collapse and making recovery more difficult. Technological solutions work by weakening the negative loops and allowing growth to continue for a while, but in the long run the result is the same. Instead we need to stop growth and level out into a steady state system before we encounter limits. We are searching for a model output that represents a world system that is: 1. sustainable without sudden and uncontrollable collapse; and 2. capable of satisfying the basic material requirements of all of its people. How to do this? Well, we could strengthen the negative feedback loops. But most people would take a dim view of increasing the death rate in order to stop population growth or increasing the rate at which industrial equipment wears out in order to stop industrial growth. What if we weakened the positive feedback loop instead? This has never been tried or even seriously suggested, but within a system dynamic model we can easily change a few numbers to see what happens if we reduce positive feedbacks, and see if it is worth trying in the real world. 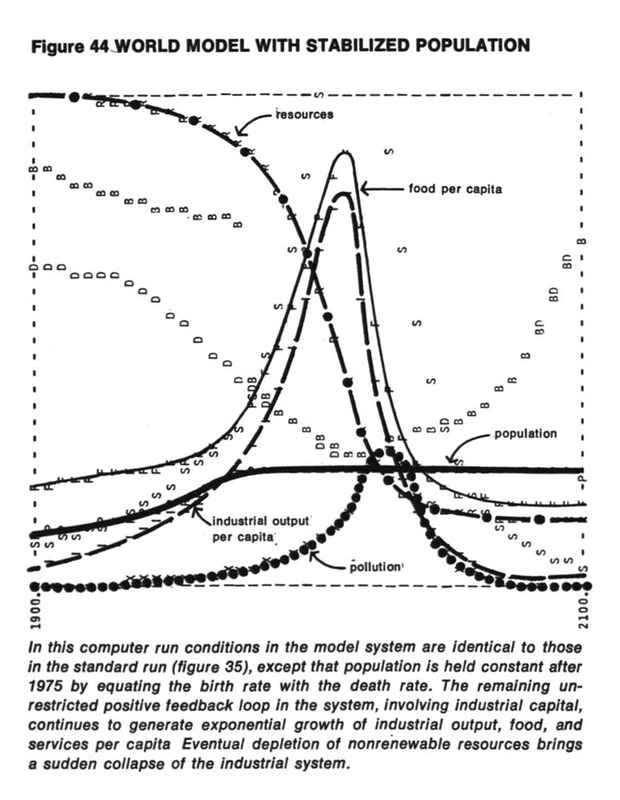 In Figure 44 the positive feedback loop of population growth is effectively balanced, and population remains constant. At first the birth and death rates are low. But there is still one unchecked positive feedback loop operating in the model—the one governing the growth of industrial capital. The gain around that loop increases when population is stabilized, resulting in a very rapid growth of income, food, and services per capita. That growth is soon stopped, however, by depletion of nonrenewable resources. The death rate then rises, but total population does not decline because of our requirement that birth rate equal death rate (clearly unrealistic here). What happens if we bring both positive feedback loops under control simultaneously? 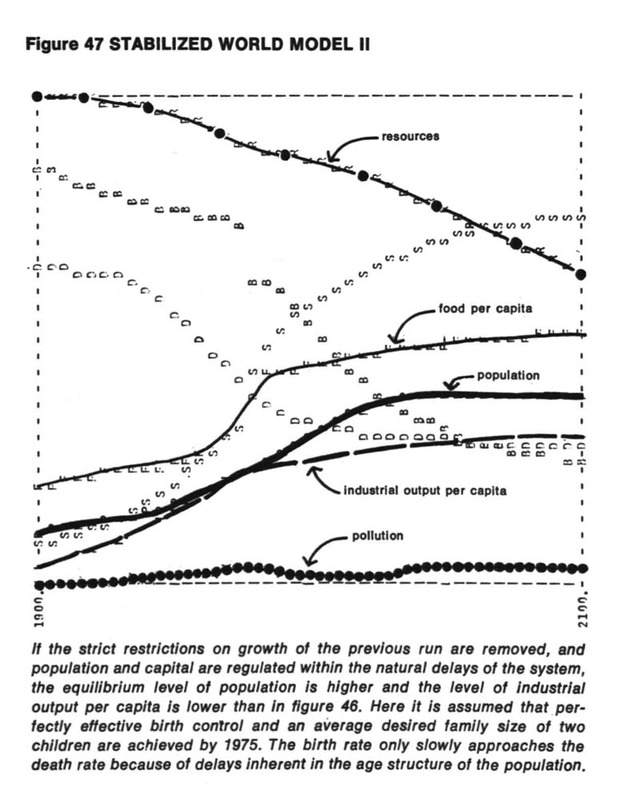 The result of stopping population growth in 1975 and industrial capital growth in 1985 with no other changes is shown in Figure 45. (Capital was allowed to grow until 1985 to raise slightly the average material standard of living.) In this run the severe overshoot and collapse of Figure 44 are prevented. Population and capital reach constant values at a relatively high level of food, industrial output, and services per person. Eventually, however, resource shortages reduce industrial output and the temporarily stable state degenerates. What if we combine controlling both positive loops with technological changes? One example of such an output is shown in Figure 46. 1. 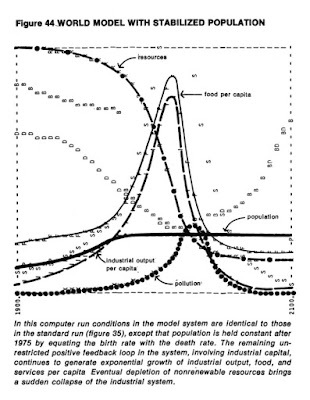 Population is stabilized by setting the birth rate equal to the death rate in 1975. Industrial capital is allowed to increase naturally until 1990, after which it, too, is stabilized, by setting the investment rate equal to the depreciation rate. 4. Pollution generation per unit of industrial and agricultural output is reduced to one-fourth of its 1970 value. 6. This emphasis on highly capitalized agriculture, while necessary to produce enough food, would lead to rapid soil erosion and depletion of soil fertility, destroying long-term stability in the agricultural sector. Therefore the use of agricultural capital has been altered to make soil enrichment and preservation a high priority. This policy implies, for example, use of capital to compost urban organic wastes and return them to the land (a practice that also reduces pollution). 7. The drains on industrial capital for higher services and food production and for resource recycling and pollution control under the above six conditions would lead to a low final level of industrial capital stock. To counteract this effect, the average lifetime of industrial capital is increased, implying better design for durability and repair and less discarding because of obsolescence. This policy also tends to reduce resource depletion and pollution. In Figure 46 the stable world population is only slightly larger than the population today. There is more than twice as much food per person as the average value in 1970, and world average lifetime is nearly 70 years. The average industrial output per capita is well above today's level, and services per capita have tripled. Total average income per capita (industrial output, food, and services combined) is about $1,800. This value is about half the present average US income, equal to the present average European income, and three times the present average world income. Resources are still being gradually depleted, as they must be under any realistic assumption, but the rate of depletion is so slow that there is time for technology and industry to adjust to changes in resource availability. We might choose to make different tradeoffs in setting up a stable system, but this example does show the levels of population and capital that are physically maintainable on the earth, under the most optimistic assumptions. What if we go back a little in the direction of the real world and relax some of the restrictions imposed in Figure 46? 1. The population has access to 100 percent effective birth control. 2. The average desired family size is two children. 3. 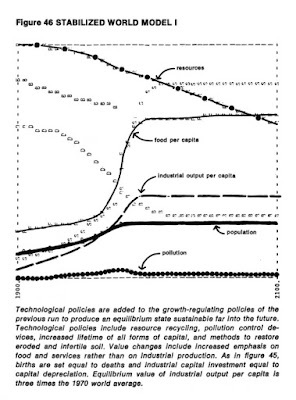 The economic system endeavors to maintain average industrial output per capita at about the 1975 level. Excess industrial capability is employed for producing consumption goods rather than increasing the industrial capital investment rate above the depreciation rate. The model behavior that results from this change is shown in Figure 47. Now the delays in the system allow population to grow much larger than it did in Figure 46. As a consequence, material goods, food, and services per capita remain lower than in previous runs (but still higher than they are on a world average today). We do not suppose that any single one of the policies necessary to attain system stability in the model can or should be suddenly introduced in the world by 1975. A society choosing stability as a goal certainly must approach that goal gradually. It is important to realize, however, that the longer exponential growth is allowed to continue, the fewer possibilities remain for the final stable state. 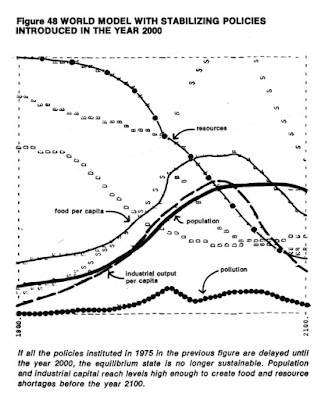 Figure 48 shows the result of waiting until the year 2000 to institute the same policies that were instituted in 1975 in Figure 47. In Figure 48, both population and industrial output per capita reach much higher values than in Figure 47. As a result pollution builds to a higher level and resources are severely depleted, in spite of the resource-saving policies finally introduced. 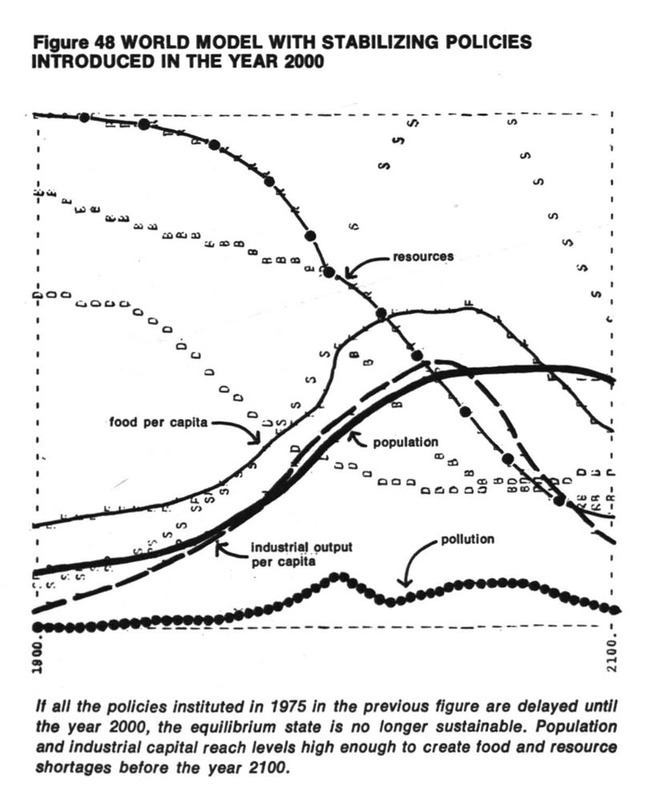 In fact, during the 25-year delay (from 1975 to 2000) in instituting the stabilizing policies, resource consumption is about equal to the total 125-year consumption from 1975 to 2100 of Figure 47. From my viewpoint in 2016, this is not encouraging. Yet it bears out much of what I have been saying is this blog all along—that resource depletion is already causing a collapse and it is too late for a solution that enables those of us in the western world to maintain our current lifestyles. Indeed there would be little point even in discussing such fundamental changes in the functioning of modern society if we felt that the present pattern of unrestricted growth were sustainable into the future. All the evidence available to us, however, suggests that of the three alternatives—unrestricted growth, a self-imposed limitation to growth, or a nature-imposed limitation to growth-only the last two are actually possible. Achieving a self-imposed limitation to growth would require much effort. It would involve learning to do many things in new ways. It would tax the ingenuity, the flexibility, and the self-discipline of the human race. Bringing a deliberate, controlled end to growth is a tremendous challenge, not easily met. 1. The capital plant and the population are constant in size. The birth rate equals the death rate and the capital investment rate equals the depreciation rate. 2. All input and output rates—births, deaths, investment and depreciation are all kept to a minimum. 3. The levels of capital and population and the ratio of the two are set in accordance with the values of the society. They may be deliberately revised and slowly adjusted as the advance of technology creates new options. 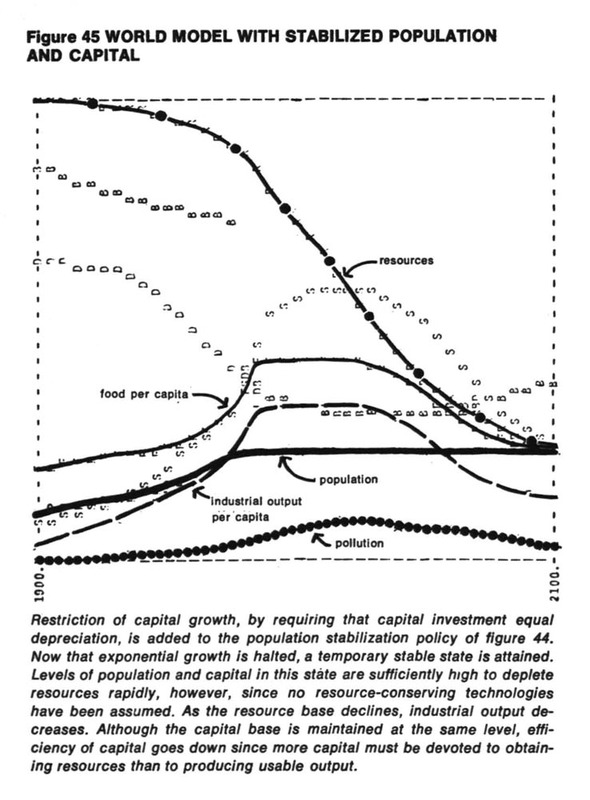 Population and capital are the only quantities that need be constant in the equilibrium state. Any human activity that does not require a large flow of irreplaceable resources or produce severe environmental degradation might continue to grow indefinitely. In particular, those pursuits that many people would list as the most desirable and satisfying activities of man-education, art, music, religion, basic scientific research, athletics, and social interactions-could flourish. contraceptive advances that would facilitate the equalization of the birth rate with the decreasing death rate. One of the most commonly accepted myths in our present society is the promise that a continuation of our present patterns of growth will lead to human equality. We have demonstrated in various parts of this book that present patterns of population and capital growth are actually increasing the gap between the rich and the poor on a worldwide basis, and that the ultimate result of a continued attempt to grow according to the present pattern will be a disastrous collapse. 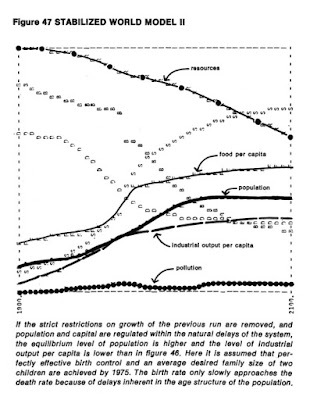 The greatest possible impediment to more equal distribution of the world's resources is population growth. It seems to be a universal observation, regrettable but understandable, that, as the number of people over whom a fixed resource must be distributed increases, the equality of distribution decreases. Equal sharing becomes social suicide if the average amount available per person is not enough to maintain life. If there is cause for deep concern, there is also cause for hope. Deliberately limiting growth would be difficult, but not impossible. The way to proceed is clear, and the necessary steps, although they are new ones for human society, are well within human capabilities. Man possesses, for a small moment in his history, the most powerful combination of knowledge, tools, and resources the world has ever known. He has all that is physically necessary to create a totally new form of human society-one that would be built to last for generations. The two missing ingredients are a realistic, long-term goal that can guide mankind to the equilibrium society and the human will to achieve that goal. Without such a goal and a commitment to it, short-term concerns will generate the exponential growth that drives the world system toward the limits of the earth and ultimate collapse. With that goal and that commitment, mankind would be ready now to begin a controlled, orderly transition from growth to global equilibrium. Forty plus years later we are no closer to having the goal they speak of. Our politicians still see "economic recovery"—the resumption of "robust" growth—as their main goal. Even though growth is the very thing that is causing most of our problems. In my next post we'll (finally) wrap up this review.